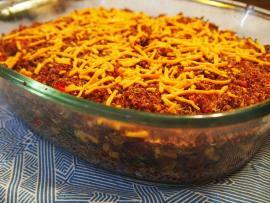 Mexican Quinoa Bake - Vegans Eat What? Vegans Eat What? This is an easy one dish meal - great for dinner or as leftovers for lunch. Coat a casserole dish or baking pan with non-stick spray. In a mixing bowl combine the cooked quinoa and salsa and set aside. In a separate bowl, mash the black beans with a fork. Add the corn, peppers, chili powder & cumin and stir. Spoon 1 cup of the quinoa mixture over the bottom of the baking pan. Layer the spinach on top of the quinoa and then the bean mixture. Sprinkle with ½ cup of the Daiya cheddar shreds. Add the remaining quinoa and top with the remaining Daiya. Bake for about 30 minutes or until the Daiya has melted.